Our inspiration comes from a fantastic game that, unfortunately, lacked quality in equipment. Guitar Hero is one of the most influential games of the 21st century. From playing classic songs, to versing your friends in competitive multiplayer mode this game has allowed numerous gamers the chance to become a rockstar! Throughout several hours of fun game play the Guitar Hero guitar-shaped controller tends to breaks down and become inoperable. The repair of these older versions of the guitar-shaped controller is almost impossible due to the previous manufacturing company going out of business. Air guitar, simply, takes the place of the older version by use of the Myo Gesture Control Armband and an Arduino. This allows for more range of motion while in game play along with creating a solution to the out-dated, broken guitar-shaped controller. 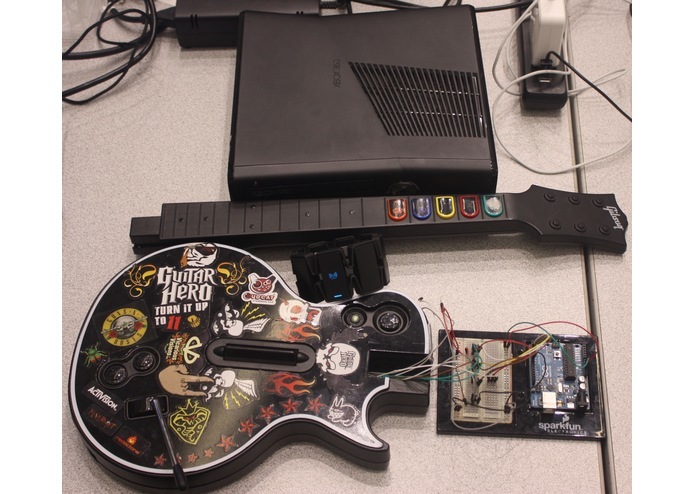 We built this by reverse-engineering a broken Guitar Hero guitar-shaped controller. We took the circuits from the Guitar Hero guitar-shaped controller and rerouted them into the Breadboard of an Arduino. We then used the Myo Gesture Control Armband to feed data from it into the Arduino. Therefore, using the Myo Gesture Control Armband data to emulate the buttons of the Guitar Hero guitar-shaped controller. We ran into several challenges throughout this project. As individuals, we both do not come from any sort of hardware background so we came into this project ready to learn. Our first challenge was deciding whether or not to use the Arduino or a DragonBoard forward data from the Myo Gesture Control Armband to the controller. We ultimately decided on the Arduino when we figured out how to implement the Myo Gesture Control Armband Library and used a computer to bridge the data to the Arduino in real time. 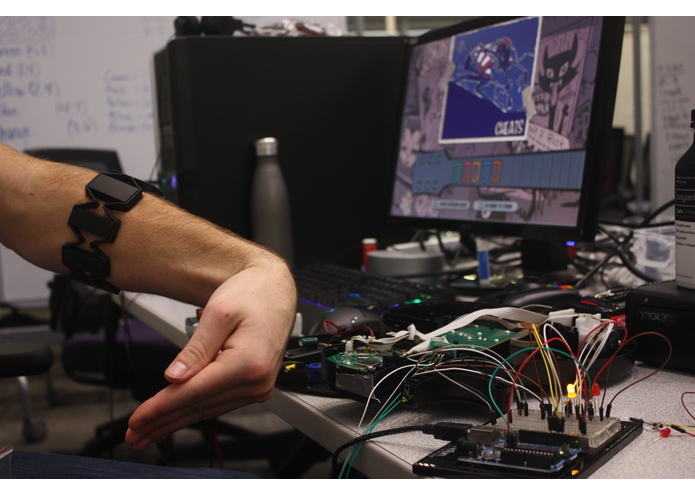 Next, we ran into the issue of creating custom gestures with the Myo Gesture Control Armband. At first, we thought that we would be able to create these no problem, but through further research on custom gestures we realized that this would be difficult to do with our time frame of 36 hours. We decided the revert to the gestures we were familiar with in order to continue our project. 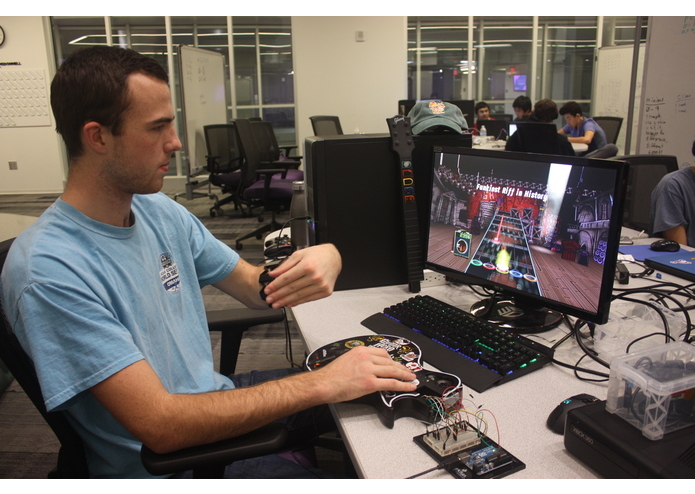 Once we figured out the correct gestures to use for our project, we ran into the challenge of understanding the construction and circuitry of the Guitar Hero guitar-shaped controller. We were perplexed by what exactly did what and why it performed that control. 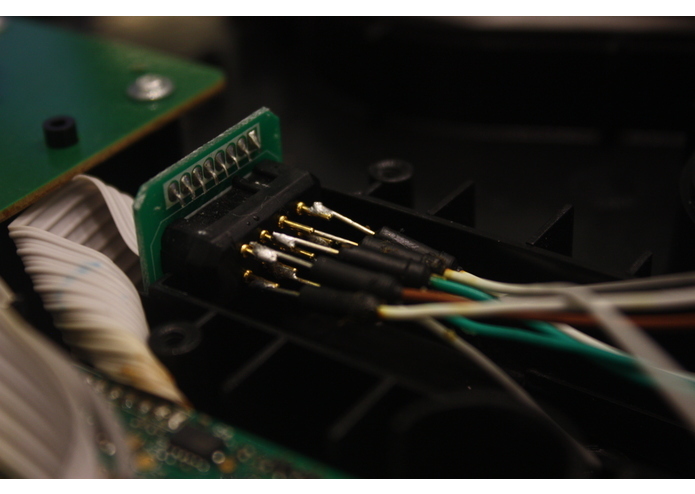 In order to overcome this confusion, we spent time researching and testing individual prongs and connectors. By doing this we were able to come to the conclusion of that we needed to connect to the Arduino Breadboard. We, also, ran into a challenge with the circuit design. More specifically, the circuit design that was needed in order to control the Guitar Hero guitar-shaped controller from the Myo Gesture Control Armband data. The design of the circuit was extremely important in order for the game Guitar Hero to pick up the new reverse engineered controller. This was a challenging project for our team. As a result of this, we were able to have several triumphs throughout the creation of Air Guitar. 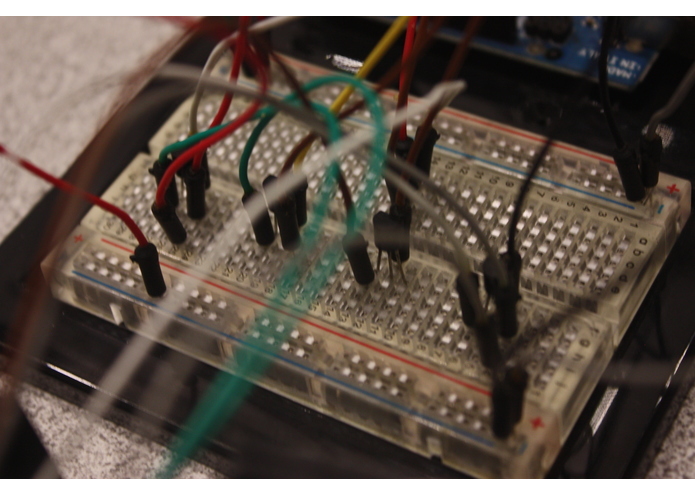 Our first accomplishment came when we realized we were going to be able to use the Arduino instead of the Dragonboard in order to bridge the Myo Gesture Control Armband and the Guitar Hero guitar-shaped controller. We were able to use the Arduino because we found a way to how to implement the Myo Gesture Control Armband Library data to the Arduino in real time. 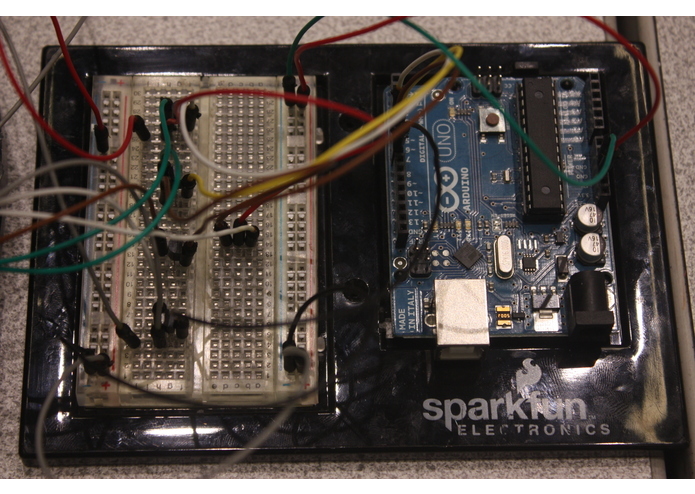 This was a success because we felt much more comfortable with the Arduino's set up due to some prior use. We had another proud moment when we tested out if our Arduino was picking up the data from the Myo Gesture Control Armband. 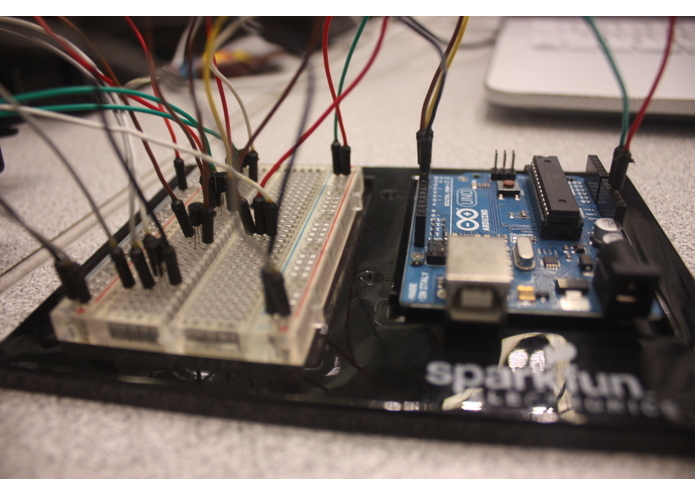 In order to do this we set up the Arduino's Breadboard with small LED lights. 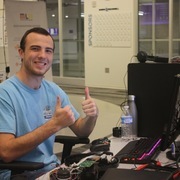 If the lights turned on due to a gesture created by the individual wearing the Myo Gesture Control Armband then we would know that not only was our code working, but our circuit set up as well. Finally, of course, our proudest moment was seeing our project become successful with our vision. Through all of our challenges and roadblocks we were able to come together and conquer this idea. 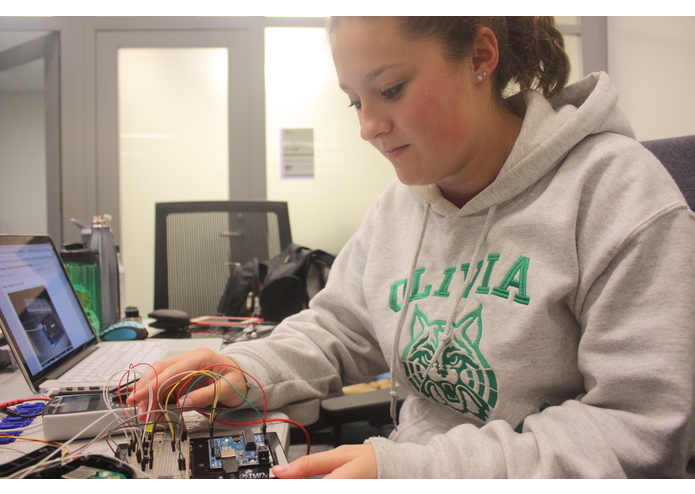 We learned several new systems, such as, Arduino, Arduino IDE, Circuit Design, Controller Connections, Myo Gesture Control Armband, and Myo Gesture Control Armband Data Library. The future of Air Guitar is to create a more user friendly product. Air Guitar was created for the purpose of taking over the outdated, plastic guitar-shaped controller that Guitar Hero currently uses. Although, the current creation of Air Guitar is not in a user friendly build. Through further implementations and builds, we hope that Air Guitar will one day be the latests controller in gaming technology. I worked on how to integrate the Myo Gesture Control Armband Data Library to the Arduino so it can be hacked and used to simulate as a new controller. 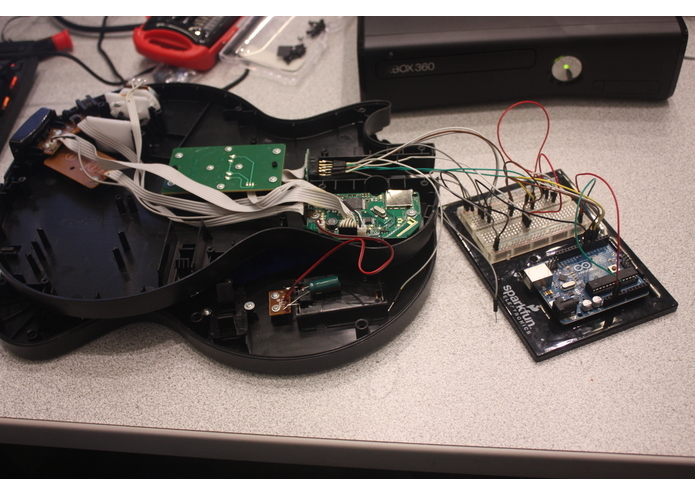 I also assisted in the reverse-engineering of the Guitar Hero guitar-shaped controller. I worked on reverse-engineering the Guitar Hero Guitar to understand electronic components so they can be hacked and used for a different purpose. I also worked on the Arduino code to handle the Myo Armband poses to be fed into the guitar and simulate the button presses. Finished first working version for Demo'ing. Strumming not implemented. Key strokes red-blue works (not orange). Created a testing breadboard with LED's to check if Myo Armband can control the transistors. It was successful, so switching with LED's with guitar wires. Soldered wires onto guitar-body-output (that usually feeds into guitar neck). Mapped wires to understand which wires control which button.